RIDING WITHIN THE LINES. 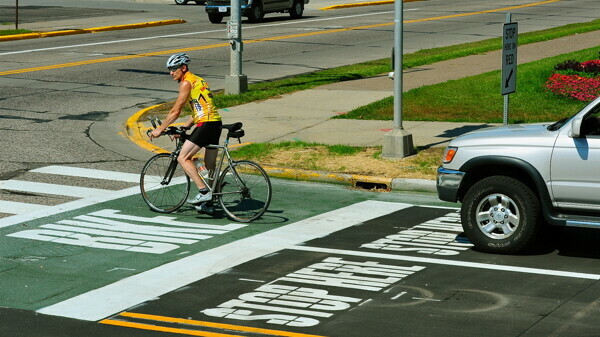 This “bike box” at the intersection of 13th Avenue East and Broadway in Menomonie is designed to make cycling safer. Apparently, Eau Claire might have to play a game of catch-up if it wants to be on the same pedal-powered playing field as Menomonie. The city of Menomonie recently created “bike boxes” at the intersection of 13th Avenue East and Broadway, in front of UW-Stout’s South Residence Hall. What exactly is a bike box? If you have a brain like me, you might be picturing a phone-booth style box that encases bicyclists. Well, not exactly. A bike box is an extension of the bike lane that is painted on the pavement in an intersection. It is a large rectangle directly in front of the space where cars would normally stop for the stoplight. A bike box is an extension of the bike lane that is painted on the pavement in an intersection. It is a large square directly in front of the space where cars would normally stop for the stoplight. When the lights change, the bicyclists in the bike box are permitted to proceed through the intersection before the cars. This allows bikers to turn and go straight through intersections more safely, specifically when they are proceeding in a different direction than surrounding vehicles. Rather than waiting until the intersection has cleared to start a turn, and potentially running a red light, bicyclists have priority at the intersection to make it through safely. Bike boxes make bicyclists much more visible to vehicle drivers, thus making them safer. An added benefit is that the separation between bicyclists and vehicles protects the bicyclists from breathing in so many vehicle fumes while waiting at intersections. Practically speaking, creating a bike box at an intersection mostly requires colored paint. No expensive equipment installation is necessary. London is also cracking down on drivers to make the bike boxes more effective. The police are handing out fines and even taking off points from drivers’ licenses for ignoring the boxes. In the United States, cities including Minneapolis, Madison and Portland, Ore., have implemented bike boxes. Menomonie Director of Public Works Randy Eide says the idea of creating bike boxes in Menomonie began when a member of city’s Bicycle/Pedestrian Advisory Committee returned from a trip to Europe with photos of bike boxes and wondered if something similar could be done close to home. After kicking the idea around for a bit, the city decided to install the first bike box in Menomonie in mid-August. Eide has high expectations for the bike box and hopes that the city will be able to install more like it in the future. Eide describes Menomonie as a bike-friendly community and wants it to stay that way. Several community members have already made positive comments about the bike box, he notes. The city of Menomonie is taking a three-pronged approach to improving the intersection of 13th Avenue East and Broadway, where the bike box is located. Eide says the three aspects are safety for pedestrians, safety for bicyclists, and better traffic flow. To accomplish this, the city has also added a pedestrian island in the middle of the street near the intersection, which allows pedestrians to cross the street more safely.